Do you find many unwanted messages clogging up your Gmail account? Or do you find that important messages are going unnoticed? Filters are a great way to organize the way emails are dealt with when they are sent to your account. Like most email services, Gmail allows users to create filters. These filters determine how different emails coming into the account should be handled. You can choose to filter your emails by a range of different aspects and then choose what should happen if you do receive those emails. 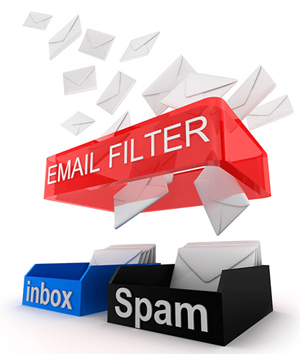 The following instructions outline how you can create email filters when using a Gmail account. Step 1) Log in to your Gmail account. Step 2) Click on the Settings Cog and then on the Settings menu. Step 3) Choose the Filters and Blocked Addresses tab. Step 4) Now you will see the words Create a new filter. Click on them to create your first Gmail filter. Step 5) Choose what type of emails you would like to filter. Enter either a word, email or phrase into the appropriate field. You can choose to enter information into multiple fields. An example screenshot can be found below. Step 6) Click on the Create Filter button. 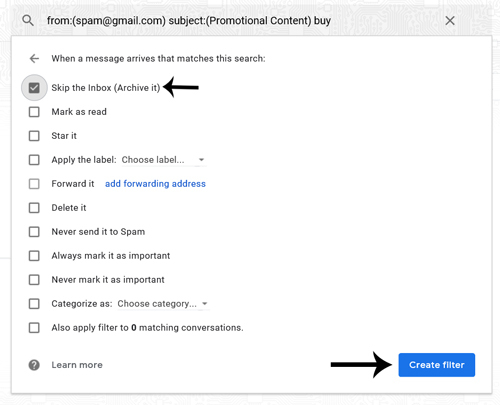 Step 7) Now you will need to choose what should happen to emails that come through that match the criteria. These may be important emails or from a known spam email. Step 8) Once you have chosen how filtered emails should be handled, click the Create filter button. Step 9) Your filter will now appear under the Filters and Blocked Address tab. If you need to delete a filter for any reason you can find out how in the section below. If you wish to remove a gmail filter you can mark the check box next to the filter in question and then click the Delete button. The filter will be removed from your Gmail account.